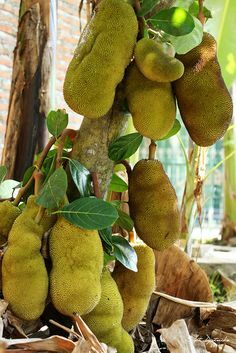 The jackfruit (Artocarpus heterophyllus), also known as jack tree, jakfruit, or sometimes simply jack) is a species of tree in the Artocarpus genus of the mulberry family (Moraceae) and a relative to the breadfruit. It is native to parts of South and Southeast Asia, and is believed to have originated in the southwestern rain forests of India. 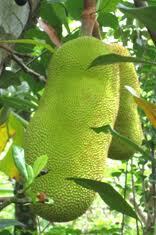 A jackfruit is a huge, spined, oval fruit that is believed to have been first cultivated in Indian rainforests. 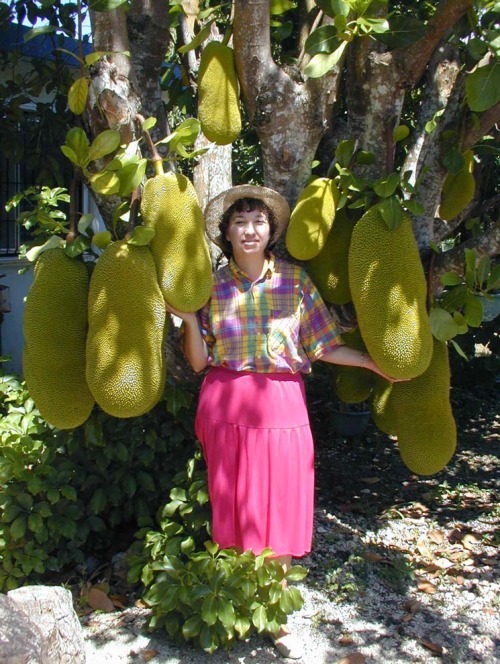 It’s mostly grown in tropical climates, and is the largest fruit in the world, weighing up to 80 pounds (about 36 kg) with a length of up to 3 feet (0.91 m). 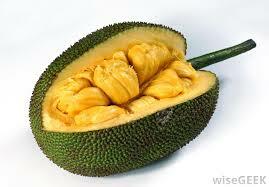 Though it has a notoriously bad smell when ripening, the flesh and the seeds of the fruit are edible. Since it’s an acquired taste, the fruit isn’t much of a cash crop, but some people do like to serve it in desserts and curries. 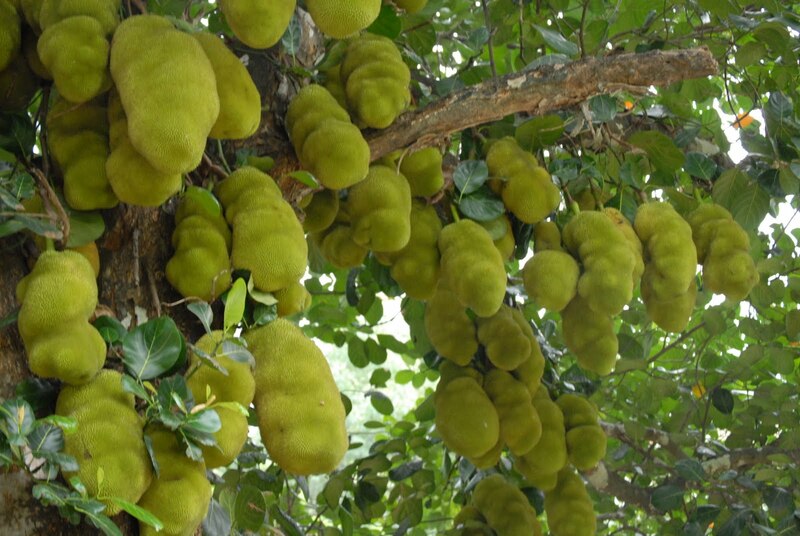 It’s also the national fruit of Bangladesh. The exterior of the fruit is not edible, but the flesh and seeds are commonly eaten. When outside has turned from green to yellow, it is ready to be picked. 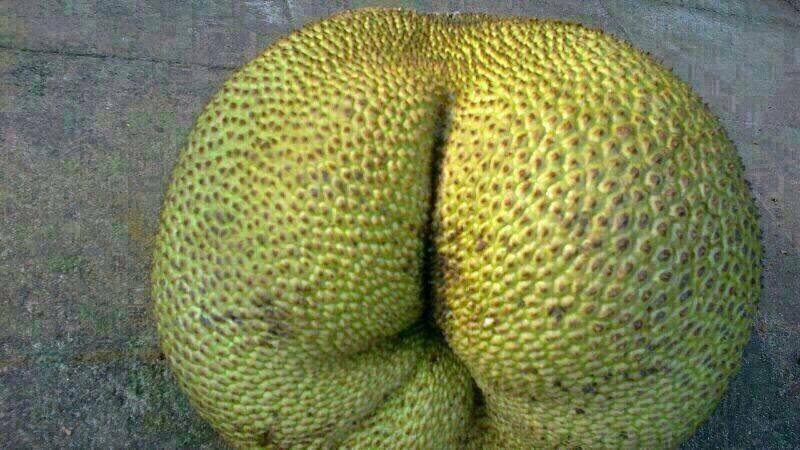 Jackfruit tends to be an acquired taste and frequently does not appeal to those unfamiliar with it. The ripening fruits have an odor that has been compared to the smell of rotting onions. This often discourages people from trying the interior. 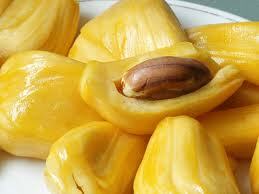 Each fruit contains numerous sweet, banana-like bulbs that many people find delicious. One variety has a crunchy, rather than mushy, texture and is generally preferred. The seeds can be roasted and are compared to chestnuts in flavor. Cutting and preparing the flesh is tricky, because the fruit is very sticky and can actually be used as glue. 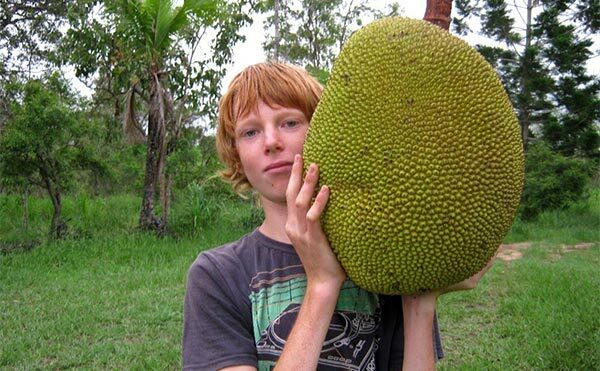 Jackfruit’s popularity varies in different countries, but in most places, the fruit is either cooked with rice or eaten raw. 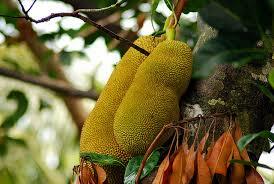 Many people don’t wait for the fruit to ripen but prepare it when it is still relatively small, unripe, and crunchy. In India, it’s eaten raw or used in curries, soups, and stews. It is also used in various deserts and is a common ingredient in fruit salads.